Nearly 32 years ago, in the mid-1980s, I was literally thrown out of a doctor’s surgery and my file was thrown after me. The nurse on reception screamed at me: “You have AIDS, get out of here now.” That’s how I found out I was living with HIV. I didn’t tell anyone — not friends or family. The stigma and fear were too great. I moved to Melbourne so the people I loved didn’t have to see me deteriorate. I didn’t deal with the fact I was living with HIV and expected each month to be my last. Then I met Dr Sandy Beveridge, who was working in HIV/AIDS patient care. He turned my attitude towards my health around completely. With his encouragement and support, I ended up on every trial going. I was an enthusiastic guinea pig for a long time. Eventually I got to the point where I didn’t want to take any more pills. I had a low viral load anyway and it just didn’t seem worth it. I didn’t take any meds for 5 years. Along the line I moved back to Sydney. Although I wasn’t taking any meds, I kept up regular tests. I’d been attending a HIV specialist service but I got sick of my doctor always being late for appointments. When I complained I was told I was unemployed and had plenty of time. I didn’t want to go to a service that treated me like a second-class citizen, so I stopped going. I had real difficulties finding somewhere to go after that. A good friend of mine, Rodd, was working for NUAA with the Hep C Buddy Program. He suggested I get my HIV tests done at NUAA but also wanted me to test for hep C. I had been immunised against hep A and B as part of Workplace Health and Safety for a job, and even though I'd had hep C tests in the past, I had always come up negative. But I wanted to help him in his new job, so I agreed. I had recently visited a friend in hospital who has since died from liver cancer after having hep C for many years. He told me that there were great hep C meds available these days and there was no need to suffer in silence. So when Rodd offered to support me in getting treatment, I knew I just had to do it. I also knew that Rodd had been where I was now, and if he said it was simple and worthwhile, then I believed him. Rodd was amazing. Even though we were friends before the Buddy Program, he had no problem being professional, totally confidential and objective. He went above and beyond for me. Rodd got me a great doctor —Dr Phil at Kirketon Road Clinic (KRC) — and came to every appointment so I was not shouldering it all myself. We would talk before an appointment and Rodd would make a note of all the things I wanted dealt with. If I forgot something, he’d ask the questions I needed answered. When we first saw Dr Phil, I “interviewed” him to see if he was a good match for me. I found him knowledgeable and caring. I have since seen other doctors and nurses at KRC and they’ve all been great. All in all, NUAA and KRC hands down beat the service I had been going to previously, especially in terms of respect and understanding. Dr Phil decided I needed to get my HIV stable again before I could start hep C treatment. That meant going back on HIV meds. Because I had got hep C only recently, the doctor told me that my liver damage was minimal and I had plenty of time to get treated. That was time I could use to get my other health problems sorted out, to give hep C treatment the best chance of working. Once my HIV was stable again, I was able to deal with hep C. I only had to take a tablet a day and I had no side effects. The treatment was successful. For the first time in a long time, I feel like my health is on track. Because I was part of the Buddy program, NUAA paid for the hep C meds and paid me whenever I attended an appointment or had a test. That helped. I had a lot of stressful money worries at the time and it was great to have another level of tension removed. It was amazing having a Buddy to go through the process with. Rodd is a good sounding board and really helped me with my stress. Part way into the treatment I split up with my partner of 15 years. Rodd helped me deal with it and stay on track with my meds and tests even though I was feeling lost and sad. He rang me regularly just to see how I was coping with the pills, whether I had any side effects, whether I was taking them properly… all that sort of thing. I'd recommend the Buddy system to anyone. It really helped to share the burden with someone who understands and is respectful. I had a lot on my plate emotionally through it all so it was such a relief to have that support. From that first test, the Buddy program has changed my life for the better. Being a NUAA Hep C Buddy is about bringing together a health professional role with peer experience. As a service, we help people feel comfortable and in control of their care. It’s about flexibility — what do they want and how do they want to use me as a Buddy? I try to be affirming, reassuring and friendly. I understand the stigma that comes with being a drug user. Here at NUAA, we treat people as people first. I’ve been through hep C treatment myself, so I can reassure people they are making the right decision by getting tested and treated. I understand the fear of finding out you have hep C then entering the commitment of treatment. I tell people the only side effect I had from the meds was that I didn’t have firm poo – that’s a great ice-breaker! I try to be comforting but also reassuring. I am very aware that this is someone’s life. I feel very confident in our partners, KRC. They really support me in my job. They really know their stuff, are respectful of our members and are great to work with. 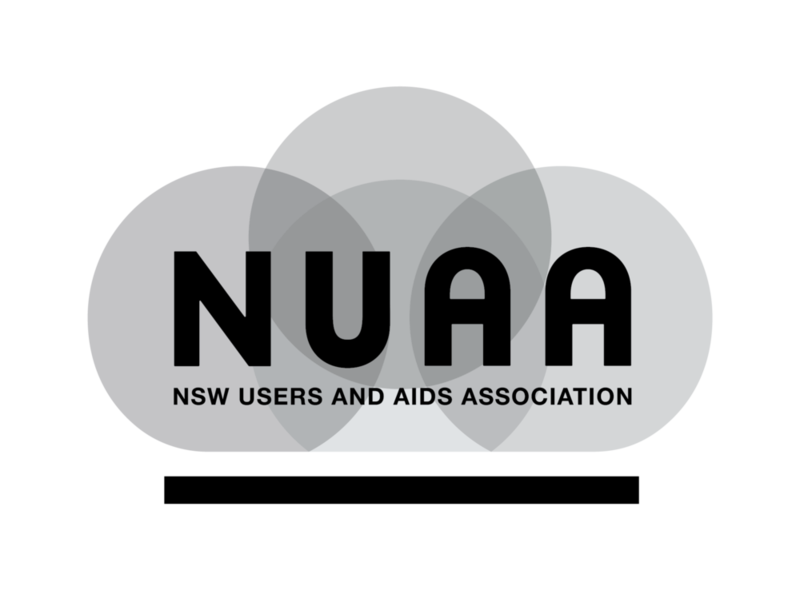 We have a KRC nurse at the NUAA NSP at 345 Crown St, Surry Hills every Thursday 2pm to 4pm (clinic hours will be increasing in October!). You can be tested for HIV, hep B, hep C and sexually transmitted infections without an appointment or a Medicare card or ID. Then we can take you to the doctors at the KRC head office above the Fire Station in Kings Cross (entrance in Victoria St) to get you started on treatment. I’ve known Logan a long time. When I came into the job as a NUAA buddy, I began encouraging everyone I knew who injected drugs to come in to get tested. It’s estimated that thousands of people in Australia don’t know they have hep C. I feel strongly that people who use drugs should look after our health. We are most at risk of viral hepatitis — hep B and C — and should get tested regularly. If, like Logan, we find out we are living with hep C very soon after being exposed to it, we can clear the virus before it has time to damage our livers. If we have been living with it for a long time without realising, it is important we find out to get treated immediately. I really encourage everyone to get tested. Logan came in to the NUAA NSP to get tested on my recommendation because he was unhappy with the care he’d been getting for his HIV. He needed to see where his viral load was at. He also wanted to support me in my new job, so he agreed to be tested for hep C.
He was ready to make some changes in his life and he just needed some direction. I never dreamed we would have him back on HIV meds too. It just goes to show what a difference having a good team of people behind you can make. I am especially proud of Logan that despite his long-term relationship breaking down mid-treatment, he stuck to it and is looking and feeling so much better. I really think that focusing on his physical health supported his mental health during a difficult time. Instead of falling apart, he pulled himself together and came out of it healthier and stronger. It was very special being a part of this important part of his life.